Tripp further stated that as early as the first days of the Bill Clinton administration there was already talk amongst senior staff about a future Hillary Clinton presidency, a position to which Hillary Clinton believed herself entitled. Tripp spoke in an hour-long interview that aired on this reporter’s Sunday night talk radio program, “Aaron Klein Investigative Radio,” broadcast on New York’s AM 970 The Answer and NewsTalk 990 AM in Philadelphia. The issue of temperament has become a central theme of this year’s presidential election, with both Clinton and Donald Trump constantly accusing each other of lacking the trait many voters find so necessary to serving as the nation’s highest executive. Tripp revealed some of what she personally witnessed firsthand of Clinton’s temperament and the way she says White House staff feared the First Lady to the point of “cowering” in her presence. “I know that that sounds scandalous. And that sounds as though that couldn’t possibly be true. But 99% of the scandals are completely unbelievable to those who didn’t see behind the [Clinton] curtain. You know, it’s almost a piling on kind of a thing. Because most people in their average everyday lives, they are going to work; they are driving the kids to soccer; there is homework; there are bills to pay. They don’t pay as close attention as someone like myself might because they’re just too darn busy. And it sounds like what the Clintons constantly say. That it’s the partisan witch-hunt. That it’s the vast right-wing conspiracy. Everyone conspires against the Clintons. They take no ownership or accountability for all of the scandals they themselves created. “I just think that when you talk about temperament you have to at least consider how the past portends the future,” Tripp added. 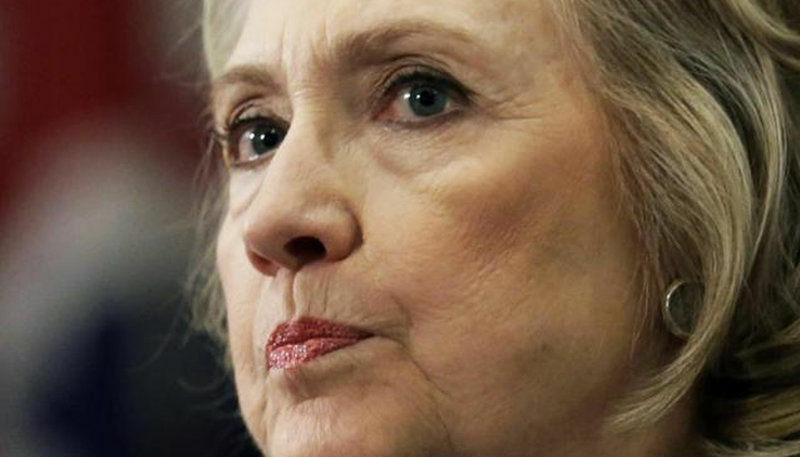 Hillary Clinton has in the past claimed numerous times that she was not yet decided on whether to run for president. One notorious example was Clinton’s response to why she took six-figure speaking fees from Goldman Sachs and other big Wall Street banks. “I wasn’t committed to running. I didn’t know whether I would or not,” Clinton said in February. Tripp scoffed at the notion that Hillary was contemplating running for the presidency. “Well, this is one of the funniest things because literally on my first day in the West Wing of the White House in January of 1993, right after the inauguration, there was a chant from various senior advisors to support staff of the president. And it was ‘Eight years for Bill. Eight years for Hill.’ In fact, some had started out with ‘Four years for Bill. Four years for Hill.’ And they were quickly corrected. But I didn’t know at that time that this runaway train was actually going to happen. Or worse, what it means for all of us today. “Both the Clintons operate from a position of ethical bankruptcy. And in doing so they have been stacking the deck for many years. They have ensured they are above the law, as we saw this year. So whether it was obstructing justice or hiding documents. You know the abusing and besmirching of women. Their patented strategy of personal destruction of those who would speak out against them. And perjury. Tripp is well-known for her role in the Monica Lewinsky scandal, documenting evidence of the young intern’s relationship with Bill Clinton and submitting the documentation to independent counsel Kenneth Starr, leading to the public disclosure of the affair. However, many people may be surprised to learn of Tripp’s larger role in the West Wing, and her firsthand experiences behind the curtain of the Clinton scandal machine. Tripp was brought to the Clinton administration from the George H.W. Bush White House, where she served as executive assistant to the deputy chief of staff to the president, a role that enabled her to become familiar with the inner workings of the West Wing. During the Clinton administration, she first served as support staff to the Immediate Office of the President, where she sat just outside Bill Clinton’s Oval Office. After three months, Deputy White House Counsel Vince Foster asked Tripp to work for the White House Counsel’s office as executive assistant to White House Counsel Bernie Nussbaum, who played a lead role in defending the Clintons in their infamous scandals. Last week, Breitbart News reported on the first part of Clinton’s interview on “Aaron Klein Investigative Radio,” in which she discussed some of the most infamous scandals to rock the Bill Clinton White House. Tripp possesses insider information on the scandals known as Travelgate, Filegate and Whitewater, and she personally witnessed the handling of documents from Vince Foster’s office the morning after he was found dead in an apparent suicide. Foster was heavily involved in defending the Clintons in the Travelgate, Filegate and Whitewater cases. Tripp was the last person known to have spoken to Foster before his death. During the first portion of our interview, Tripp reopened each of those scandals – Travelgate, Filegate, Whitewater and the issues surrounding Vince Foster’s death – and she used her unique vantage point to explain how the notorious cases foreshadowed many of the current Clinton controversies, from the Clinton Foundation to Hillary Clinton’s private email server troubles. Ask anyone who has ever witnessed or dealt with demonic possession or demonic influence and they will tell you how often it masks as psychotic personality disorder or schizophrenia. The evil things that the Clintons and the Obamas have brought about in the course of their destructive lives have created spiritual voids in their souls that allowed demonic, evil entities to inhabit. The truth is ignored because it seems too crazy and fantastical.